The confusing “suggested attire” section of a holiday party invite can quickly kill the fun vibes. What does “festive” mean anyway? To eliminate the dress code guesswork, here are the rules of what to wear—from festive to white tie to cocktail attire and beyond. One of the most common party dress codes (because hey, who doesn’t love a good whiskey sour? 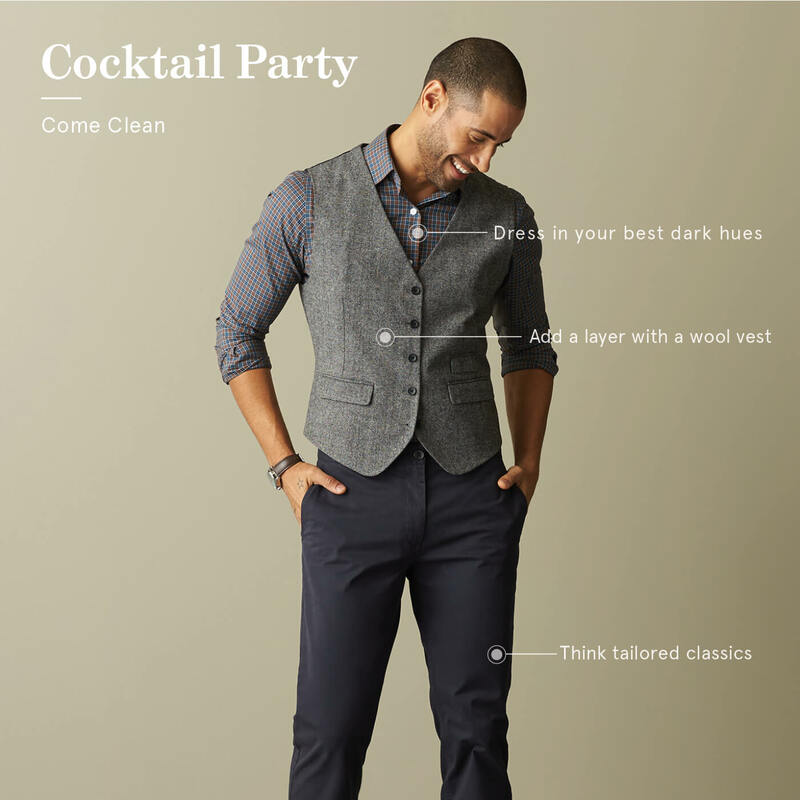 ), “cocktail attire” is akin to semi-formal. Traditionally, men would always wear suits to cocktail parties, but there’s a bit more flexibility these days. A suit in a darker color palette—with or without a tie. Dress pants with a dress shirt. Throw in a wool vest to add a layer. Blazer or sports jacket with a pair of chinos or dark-wash jeans. Brogue-oxford dress shoes. Make sure they’re shined—no room for negotiation here. Outfit accents, like a nice watch, silk tie or pocket square. Show off your holiday spirit—without looking like a department store mannequin. This means no Rudolph sweater with flashing bulbs that plays jingles. Sure, it’s tempting. But use some restraint, man. 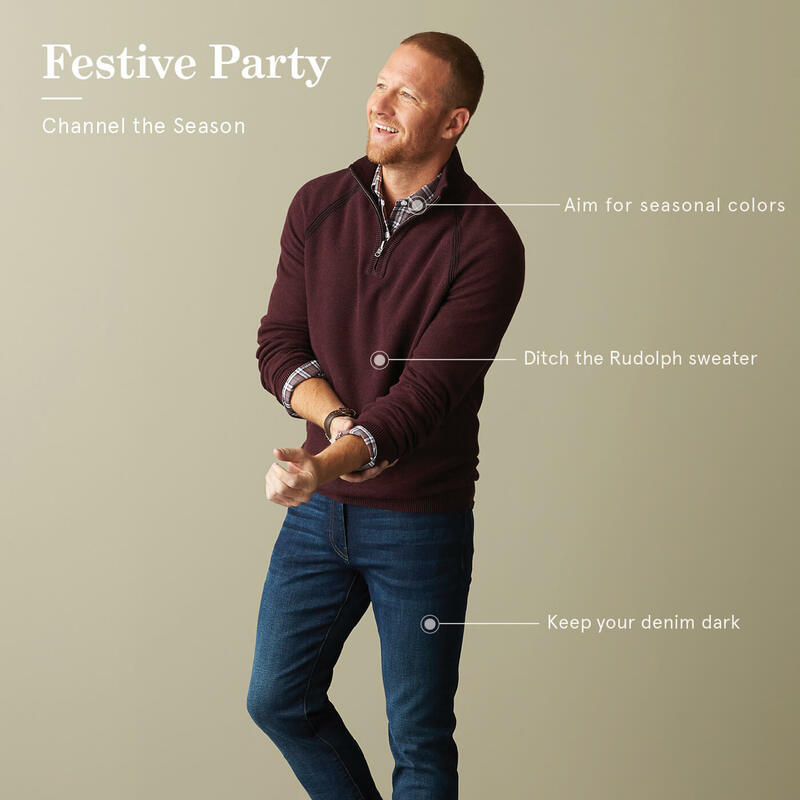 Festive attire is like cocktail attire, but with a holiday spin—and has a more casual, easygoing vibe. Stick with the colors of the season. Play around with cooler or darker shades of green, red or white rather than opting for bright, saturated hues. If you have a bold personality, go all-in with a festive suit, like a tartan plaid or herringbone. Add an accent with bright or patterned socks. Ground your look with wingtips or Chelsea boots. The fanciness level of this dress code can vary depending on where you work. 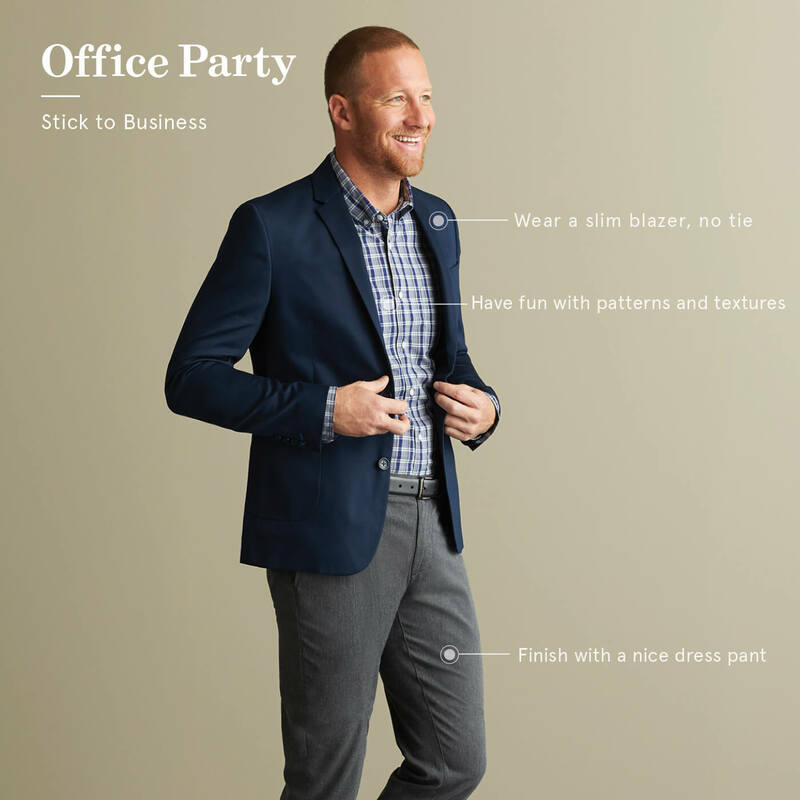 Start by taking a cue from the day-to-day attire at your office. Still not sure? Think of it as a relaxed office outfit that exudes class. You’re still among co-workers, after all. A blazer is always a safe bet—but the tie is optional. Play with patterns and textures, like a checkered button-down paired with classic wool pants. Don your best loafers or a moc ranger boot. What does “black tie” mean? It’s time to sport a tux. These days, however, a makeshift version (see: black suit, white button-up, black bowtie) are totally acceptable for the modern man. Want to add a little more edginess? A midnight blue dinner suit is a sleek way to break from the norm. A velvet accent is also an on-trend way to look smooth for the occasion—just don’t be that guy and go full velvet (never go full velvet). A black double-breasted or three-piece suit. White pleated dress shirt with a turn collar and double cuffs. A velvet accent, such as a bow tie or slippers. A velvet accent is an on-trend way to look smooth—just don’t be that guy and go full velvet (never go full velvet). Think of this as the quirky cousin of the black tie affair. It’s still a formal, suit-and-tie look, but this is your moment to add more flair and personality. This is also often called “black tie optional,” so you can ditch the tux altogether for a dark suit and no tie. A tux or dark dinner suit, with a funky or bright bow tie or printed dress shirt. An adventurous suit in a tartan plaid (or other pattern of choice). Monk-straps, oxford dress shoes or cowboy boots (if you’re going for “Texas black tie”). When it comes to formal events, this is the highest of the high. The crème de la crème. White ties are normally associated with royal events in giant ballrooms (What are you, important or something?) Make sure not to get any ketchup on your collar. White bow tie and black coat with tails. White vest over a white wingtip-collared shirt. Got a party invite in the mail with no official dress code? The paper quality and invite design are stellar indicators of how to dress. If it’s printed on fancy stationery with gold embossed writing, take the cue to come distinguished. If the host used a silly bubble font (or, gasp, comic sans), you have a bit more wiggle room for creativity. If you have no earthly idea what to wear, reach out directly to the host. There’s nothing wrong with getting clarity. Still need help with getting your wardrobe ready for holiday party season? Ask a Stylist for some last-minute help.